A frenetic rhythm for instructors in Porto! 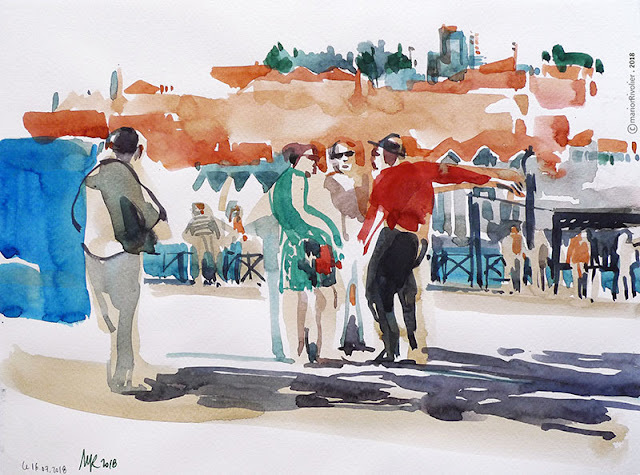 I was lucky again this year to give workshops at the Urban Sketchers Symposium in Porto. I arrived two days before the start to prepare my course, "Capturing space and people in the same gesture". The first thing is to find the ideal location, people sitting, standing, moving, a varied but not too complex urban landscape, shade in case of burning sun and calm, if possible... Leaving the Ribeira, too tourist, too noisy and too sunny, I choose the Tram Stop that seemed to meet all my desires. I tested all the exercises of my workshop as well as my demo, from several points of view. I liked to discover these places by capturing characters: tourists, locals, workers, waiters, waitresses, bus drivers, and some designers. The colors of Porto begin to emerge: a beautiful range of colored gray enhanced with intense pink, orange and yellow. The changing blue-green color of the Douro is a nice counterpoint to blackmail these colors. The same evening we were lucky that the mythical Livraria Lello open only for us. This bookstore is wonderful but extremely complex to paint. How not to paint all details of this incredible decoration and hundreds of books? The next day, why not continue in complexity with the Ponte Luis I, built by Gustave Eiffel? This is the first Sketchwalk. It's pretty amazing, every meter, there is someone drawing. I do not know how many bridges were crunched but it would be interesting to create a gallery! I like the relationship of the blue-gray color of the bridge with the background in warm colors. The sky is cloudy which brings a density to the composition. Thursday morning, I taught my first workshop. We speak movement, light, silhouette, attitudes, shadows, reserve and large colored masses in a studious and attentive atmosphere. Everyone tries to integrate my proposals into their own work, it's really interesting. Rita Sabler, one of the correspondant, wrote a wonderful post about it, thank you very much Rita! I did a warm-up for my demo with Skit Sketch, quick lectures on various topics around drawing and its relationship in the community. I capture the attitude of each speaker in a single gesture, fast and precise. I am ready for my Demo. I believe there are at least 25 participants. They are very interested and ask a lot of questions. I explain the process upstream because during the demo, I will have trouble speaking. Indeed, we must remain extremely focused to capture the characters and the urban landscape in the same gesture. We have little time, so I paint very quickly. I feel like I ran a 400m at the end of the demo. I am leached. Thank you Ben Luk for the pictures! The instructors have very little time to draw during the Symposium so on Friday night, I do not resist capturing the Luis I Bridge in this nocturnal atmosphere. I do not see much. I mix my colors blind and I feel that it works. It is difficult to paint watercolor nocturnes because it is hard to darken enough. Back at the hotel, I see that the atmosphere has been made. Thank you to the wonderful team, Portuguese team, volunteers who made everything easier for us! I hope to see you next year in Amsterdam!